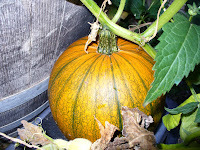 My somewhat newly discovered pumpkin is turning orange at an astonishing rate. It was only about 10 days ago when I first detected a faint trace of orange gracing Junior's crown. A check this morning reveals more orange than green. It's sort of an awkward combination, a little unattractive, really. But I know from years of as a purchaser of carving pumpkins that full-on Halloween orange is just around the corner. It's the middle of August, and true to form, the last two mornings have had a distinct chill. The air is clear. The lazy haze that days in the 90s leave behind each night is gone for now. My roses have perked up, enjoying a respite from the heat. Thankfully, there will be more days in the 90s before the leaves (and snow) fall, but a cool warning shot has been fired across our seasonal bow. There are other little signs. My sedum blooms are beginng to go from chartreuse to dusky pink on their way to a brick red that melds nicely with autumn colors. A rogue sunflower has taken up residence in what use to be my night garden. The goldfinches' bright yellow feathers are giving way to a darker, more somber tone more in keeping with winter. And there's my pumpkin. Turning orange. Just in time for Halloween. P.S. 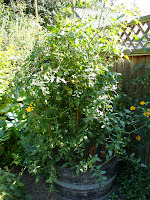 And see what I mean about our cherry tomato plant?